It is often an inevitable part of parenthood: A child finds a marker, and artwork is sure to be found in the most inconvenient, if sometimes humorous, locations. Marker stains on any fabric surface can be difficult to remove, and the problem is compounded when the stain is found on an item that cannot be laundered in a washing machine or brought to the dry cleaner's. Rest assured, with a little bit of common items and some elbow grease, the mattress can look as good as new again. 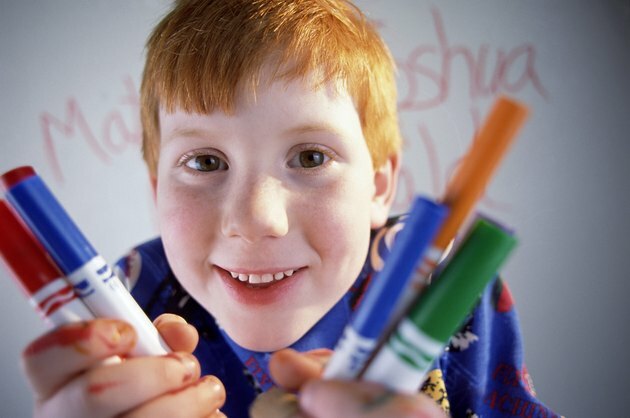 Remove the marker stains and encourage his artistic work on paper. Dab a paper towel over top of the marker-stained mattress to soak up the top layer of marker. Do not rub because this can simply smear the stain. Do not use a dark-colored towel or cloth because some of the color from the cloth may bleed into the mattress, worsening the problem. Pour a small amount of the nail-polish remover onto another paper towel. Lift up the edge of the mattress and dab the paper towel against the mattress. This is to test the mattress to make sure the nail-polish remover does not do any further damage by affecting the color or finish. Add more nail-polish remover onto another paper towel or a light-colored cloth. Pat the stain with the paper towel or cloth. Start at the outside edges of the stain and work inward. This helps to prevent the marker stain from spreading further outward. Cover a fresh cloth or paper towel with more nail-polish remover and repeat the patting process, working inward from the outside of the stain. Repeat one or two more times to completely remove the stain. Use a fresh cloth or paper towel each time to prevent transferring the marker back to the mattress. Pour some clean water onto another cloth or paper towel and dab over the area that was stained to remove the nail-polish remover. Repeat to remove as much as possible to prevent skin irritation.